Articles, reviews, reports and more on the art of shooting. My first experience for this match was in 2017 as a last minute invite, but I enjoyed the match enough to make it back for 2018. My partner for both years was Greg Hamilton, and this match was the manniversary of our duo for competitive team shooting events. The prior year’s match was our first match working together, and while we finished in second place we did not take home any hardware. 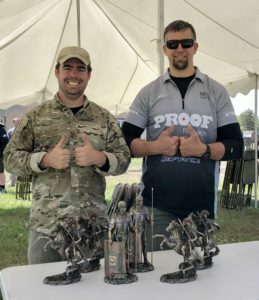 My partner Greg has been attending this match for several years, and while we wanted to place well he really wanted to bring home a trophy as Stillwater Tactical has some of the coolest trophies we’ve ever seen for a competition. 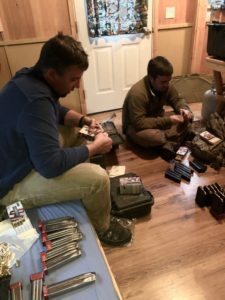 Our preparation for the event included gear planning, rifle setup and physical training. This match is not very restrictive on gear setup, generally if you want to drag it along you can bring it. Given the course descriptions and approximate round counts, we planned out our assortments for each CoF. 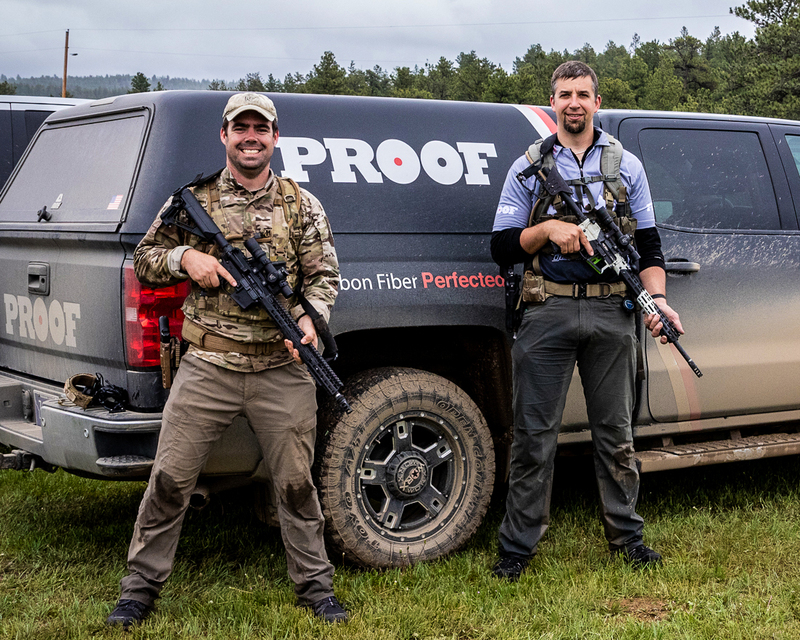 When it was all said and done, we packed the back of the Proof Express (full size Chevy Silverado) pretty full of guns and gear. Due to work commitments, our schedule had us running the Dynamic course at 7am on Saturday, and the Short course at 4pm that afternoon, with the Static course at 7am on Sunday before the Team vs Team. Normally the running courses are split between Friday/Saturday, but we’d have to make do. We began our run through the Dynamic course a few minutes after 7am, staring down overcast and drizzling skies. From the start point, it is about a 1oo yard run to station one. Here, shooters had a shooting platform suspended by springs. As a surprise variation from prior years, a barricade was built on top of a pallet. The shooter was required to support the rifle via the barricade and any supporting equipment plus shooter had to be on the pallet. With Greg being 6’5″, he decided to go with the reverse kneel for shooting his carbine targets. I ranged and recorded targets as I could find them, and was able to keep feeding target data to Greg as he settled in for each shot. Once he finished with his 5 targets, I climbed up and tried to make a sitting position work. 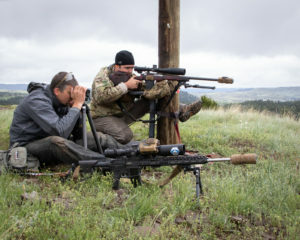 As an avid fan of using a tripod for rear support, Greg helped me position the tripod on the pallet, while I setup the rifle on a Gamechanger bag for front support. This setup was very solid, and took minimal time to adjust the rifle and settle the platform. I found my targets and got most of the points possible, missing a few to some wind at longer distances. Between both shooters, we had targets from around 300 yards to 700 yards. Once the team is finished with the first setup, a run up the infamous hill to the second position was required. 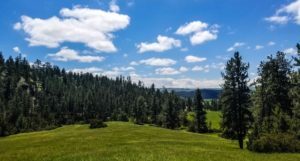 There are two ways to approach the hill, one is to follow the dirt road on a more gradual path, or cut the distance in half and go straight up the side. Either way, it’s not a fun trip dragging rifles and equipment under a time pressure. At the top of the hill is the rooftop firing position. For 2018, the roof was facing so that the peak was in the middle, meaning shooters would have to shoot from either slanted side or across the top. We elected to center the rifles on the peak for shooting. 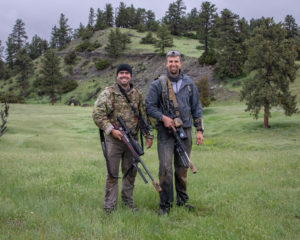 Targets ranged from about 300 yards inside of a car to 750 yards up the face of a ridge. Here we had 6 targets each to find, range and engage. The third position was the advertised milling stage, where electronic range finders were not allowed. 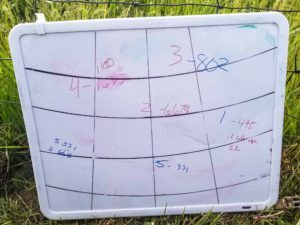 Upon arrival at the shooting position, the team was given a laminated piece of paper with pictures of the targets and height measurements. Each shooter had 5 targets to engage. We had planned on using a Mil-Dot Master in conjunction with our reticles, and it worked out really well. My riflescope was a Nightforce ATACR 7-35×56 F1 with the Mil-C reticle. The main lines have .2 Mil spacings, but there is also an inverted “T” that has .1 Mil alternating lines for just this exercise. As the targets were in the grass, some interpolation based on the image provided was required to make sure correct Mil values were used for a correct range calculation. It was important to also have a little gut check as well, to make sure our math was indeed correct or if it needed a re-check before potentially wasting a shot. The 35x magnification and reticle combo proved to be perfect medicine, as we did not miss a target distance. I dropped the last shot on this stage as I went for a bonus target, but just missed the edge due to a slight drop in the wind. Moving to the fourth position, there was a telephone pole with a treestand mounted about 4 inches off of the ground. Here, shooters had to engage multiple targets with themselves and any needed gear all on the tree stand. Once we figured out a position, it was fairly easy to stabilize the rifle with a few bags. As some targets were low and some requiring the barrel aiming higher, I ended up with two positions. The first worked out for me to hang a leg off the left side while sitting on my right leg to get the right height, followed by a reverse kneeling on the others. Greg sat Indian style for his carbine targets. We lost a few shots due to some wind and a few to loose nuts behind the trigger, but survived this with a majority of hits. The last firing position was a grinder with 8 shots per shooter. Most teams did not finish the entire CoF, or even get to the bolt gun shooter. The shooting position had a board with slots that all rounds had to pass through. For this, Greg setup with a tripod to fire through while I started finding targets. 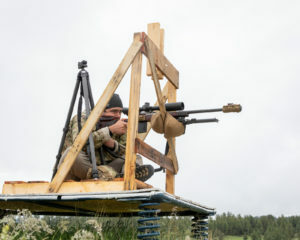 All of the targets were not visible through one slot, so moving the entire rifle/tripod setup for different targets was required. We were able to engage all 8 targets with the carbine, and I grabbed the bolt gun and got one shot off with only seconds remaining. Once time was called, we each took a big breath and started pulling our gear off the line as another team was working their way along the course behind us. The range officers told us we had shot well, and to that point nobody had finished the Dynamic course. In the end, only one team made it through the whole course, but we had enough hits to take 1st place on the Dynamic stage. We took the long walk back to the truck to take a break and then reset gear before our afternoon Short course run. 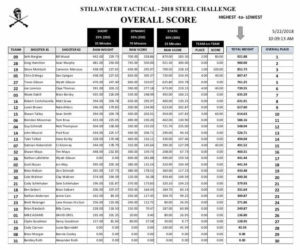 The Stillwater Tactical Challenge Short Course is something that will make you come back year after year. It’s a run through the woods with your team mate, each slinging carbines and pistols with a lot of ammo! 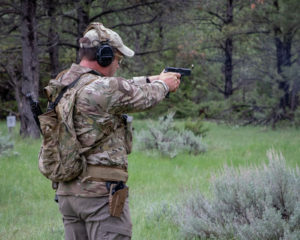 Shooters have 35 minutes to make it as far as they can, engaging red targets with the rifle and white targets with the pistol. Since Greg and I couldn’t decide who started with what guns, we flipped a coin and determined I would start with the rifle and he with the pistol. Our loadouts included PROOF Research carbon fiber barreled AR-15 carbines with Nightforce NX8 1-8x optics, our pistol of choice (Greg had a 6″ EMG Custom 2011 and I had a Glock 17 Gen5), with 8 AR-15 magazines and 10 pistol magazines a piece and the necessary belts and chest rigs to carry it all. 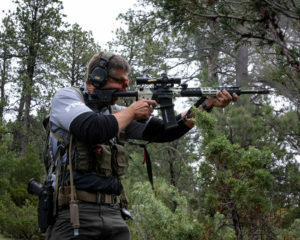 As a bonus before the time started, teams had the opportunity to spin an MGM Targets rifle spinner at about 50 yards with an H&K 91 .308 battle rifle and 4 rounds. It came in handy that I was a fan of and familiar with H&K roller locks, and I was able to get us the bonus points by spinning the target. We then walked the 10 yards to the start position, and made our respective guns hot before the fun started. The next 30 and a half minutes were all a blur, but it involved a long jungle run blasting target after target. 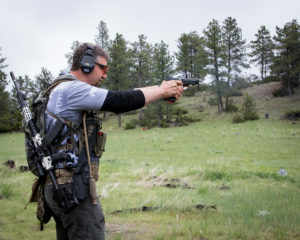 At the halfway point, Greg had an array of pistol targets and a spinner to flip with his pistol, then I had some small multi-colored targets to engage from different rifle ports. We then unloaded our first gun and switched to the other we had carried along. I had to roll the spinner again with the pistol and then we were off for the back half of the course. The strategy that worked for us involved pointing targets out for each other and moving not so fast that we passed targets. 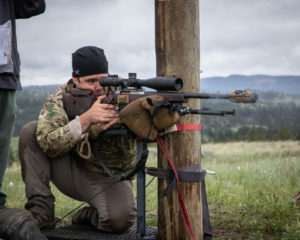 For our shooting time, many teams had run the course so the steel was more of a dull gray with some red or white paint remaining, which made them hard to find within the Montana timber. Some sections had fewer targets and more movement, while others were target heavy. The course designer told us they added another 30 targets for each firearm, meaning there were about 240 targets total for the team to get two hits a piece on. We made it to the end and finished firing with about 4 minutes remaining. 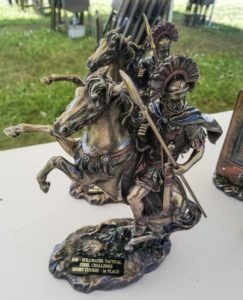 According to the range officer we had a clean run, and we ended up finishing this course in first place. 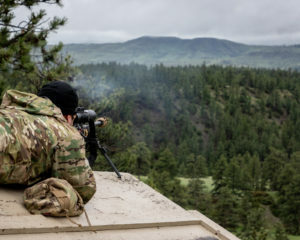 The Static course is a test of marksmanship skills that can be a great equalizer. In 2017, the team that won crushed the stage versus everyone else with such a commanding lead that they ultimately won the match. For 2018, they allowed the carbine shooter to bring a bolt-action rifle as some of the targets went beyond 1100 yards. Knowing this, Greg brought his regular PRS rifle since there was no running involved. We had a 5 minute preparation time, which was setting up rifles, equipment, etc without ranging targets. This year there were 5 target arrays with painted number boards indicating which order they had to be shot in (not close to far). There were 1 MOA, 2 MOA and 3 MOA targets at each array, with 30, 20 and 10 point values respectively. Each shooter had 5 rounds per array for score, however once target size decreased the team could not go back up (for instance if shooter 1 ended on 1 MOA target, shooter 2 could only fire on the 1 MOA target). Greg started out with a slight left of center hold on the 2 MOA plate with me spotting next to him. We had good trace, and I was able to see his impact was slightly left of center. 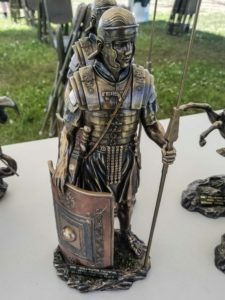 He fired a second shot, hitting at POA=POI, followed by his remaining 3 rounds getting hits on the 1 MOA plate. I started with the center hold as well, ending up just at the right edge of the plate. My remaining rounds were solid hits on the same plate. The second array was fired the same way, except with a slight left hold for a small amount of wind. We both cleaned the second array at a methodical pace. Our third array saw us drop a shot or two due to wind, however we engaged in the same pattern (2x at the 2 MOA plate followed by the remaining at the 1 MOA plate). For the fourth distance, our 6mm Creedmoors seemed to struggle a little with seeing splash for either hits or misses, and we ended up with only a couple hits on the 2 MOA plate. The last array was much closer, but the rifles had just fired 20 shots in about 10 minutes and were producing some strong mirage off of the barrels and suppressors. We decided to pause for a few minutes as we had more than 6 minutes left at that point. At 5 minutes remaining, we began firing with Greg cleaning his shots, but I dropped a couple due to some wind building on the 1 MOA plate. After the firing was complete and scores tallied on the Static course, we would end up finishing in 1st place. Going into the final event, we were in first place overall but the second place team was close behind in points. We would need to be able to finish with at least a few points to hold onto the lead for the overall win. 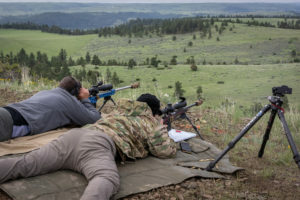 This year the team vs. team event featured an array of targets that included an MGM Whirlygig at 115 yards and a single plate at 250 yards for the carbine shooter, with plates at around 325, 445 and 550 yards for the rifle shooter. Everyone started behind the firing line with all ammunition in plastic trays, and everything else staged at the firing line. On the “Go” command, both teams ran to the line and got the carbine shooter started. Only after the carbine targets were cleared could the bolt gun shooter start to load magazines or engage targets. Because we were in first place, we ended up with a first round bye. This would prove to not help us as we ended up competing against the 3rd place team and lost in our match up to put us out of the single elimination shoot-off. Overall, this match is one of the most fun matches you can shoot. The larger event style stages are different than other matches, but it creates some new dynamics for shooters to deal with on top of working with a partner. 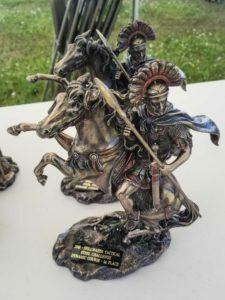 We ended up accomplishing our goal of finishing with several really cool trophies, and are already looking forward to 2019. 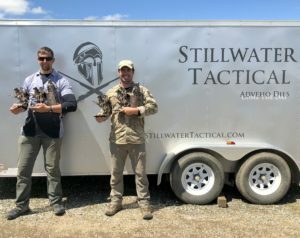 If you want a fun match that includes hanging out with great people in a beautiful location (despite a high chance of spring time rain), check out the Stillwater Tactical Challenge. Tactical Division Hat Trick, Or: How I Learned To Love The .308 For PRS Shooting.